With US equities opening somewhat weak, the VIX managed an early morning peak of 17.08, but with a rather strong intraday rally, the VIX settled +7.6% @ 15.98. 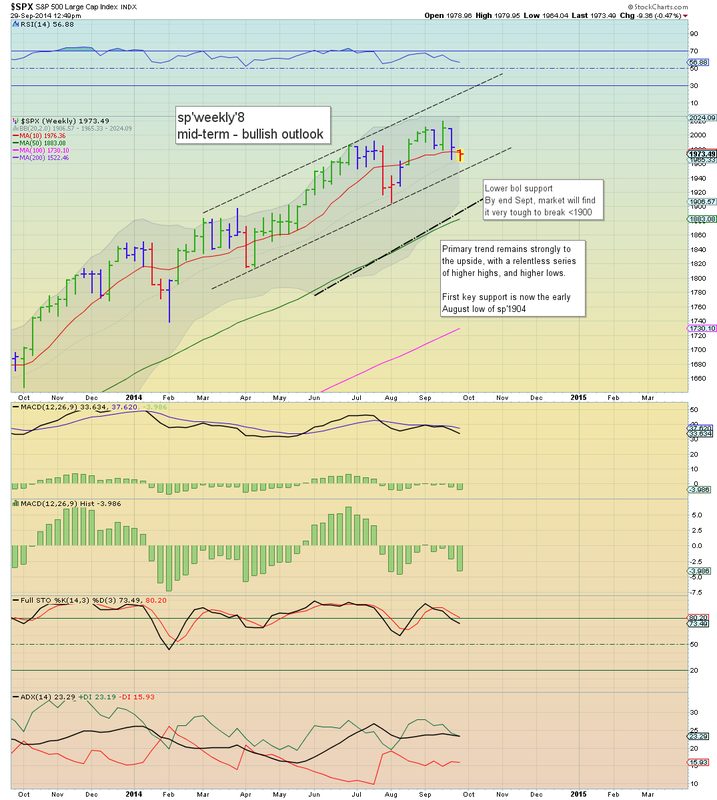 The multi-week up wave continues, and the 18/19s look viable if sp'1950/40s this week. 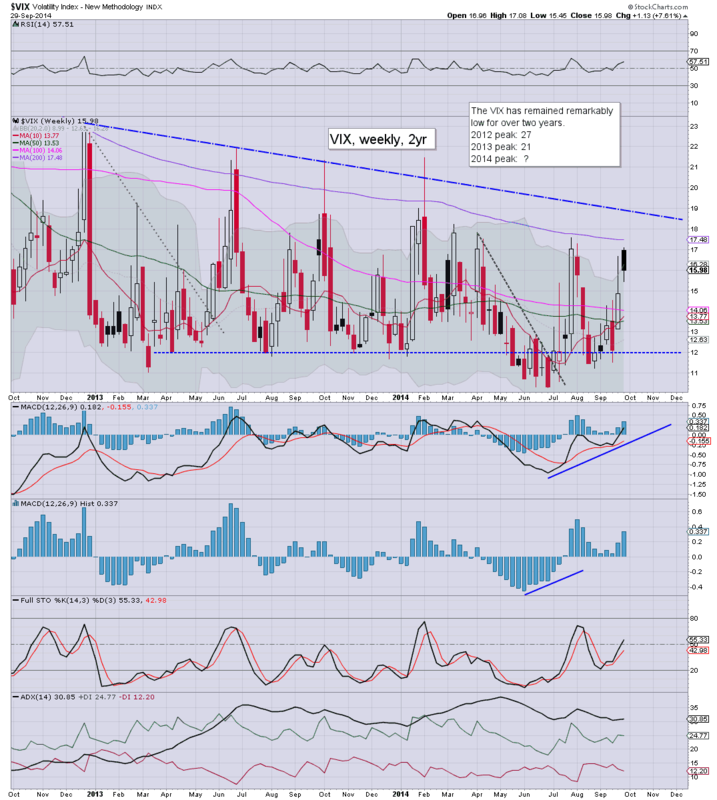 *as noted last week, one of the top aspects that the equity bears need to see is a weekly VIX close above the 200 MA. Clearly, Friday was a fail... but maybe this Friday will see a close in the 18s. Interesting day, with an opening black-fail on the hourly cycle, but still...a net daily gain.. and we're putting in higher highs..and higher lows. The 18/19s still look viable by late Tuesday, which would likely equate to sp'1950/40s. US equities closed moderately lower, sp -5pts @ 1977 (intra low 1964). The two leaders - Trans/R2K, settled +0.1% and -0.1% respectively. Near term outlook is for continued weakness, as supported by the bigger weekly cycles. Today was a pretty messy day. The opening weakness was certainly not expected by many, after the Friday gains... and yet once again, the bulls managed a very significant intraday bounce. For the equity bears, at least the Thursday low of 1965 was broken (if marginally), and with VIX 17s helping to confirm it. As for tomorrow, well, all that can be said right now is that the weekly cycles ARE bearish, but we're still seeing rather strong bounces that negate much of the declines. All things considered, bears need to end tomorrow in the sp'1950s - with VIX 18/19s... or new historic highs can be expected in October. *I remain holding short.. seeking an exit in the 1950/40s, along with VIX 18/19s.. that still seems viable tomorrow, as Q3 will come to a close. 3pm update - rats to bail into the close? A very important closing hour is ahead for both sides. Bulls seem exhausted after a late morning bounce.. whilst bears are showing renewed strength, with a VIX that is battling to challenge the opening high of 17.08. ... this closing hour could really help shape the next few days.. which in themselves..could determine what happens in Q4. Indeed, Q3 ends tomorrow... are we going to see a little wash out to the 1940s, with VIX 18/19s? *I will likely hold short into tomorrow, unless VIX breaks into the 18s, with sp'1955/50... but that doesn't seem at all viable until tomorrow. 3.19pm... VIX cooling, now just +7%... and bears are failing. I suppose a moderate VIX net daily gain is better than red, but still...its just not enough. Disappointing... and if we don't break into the sp'1950s tomorrow... then this down wave looks complete. 3.36pm... Major fail for the bears. Daily index candle... spike-floor.. reversal candle. 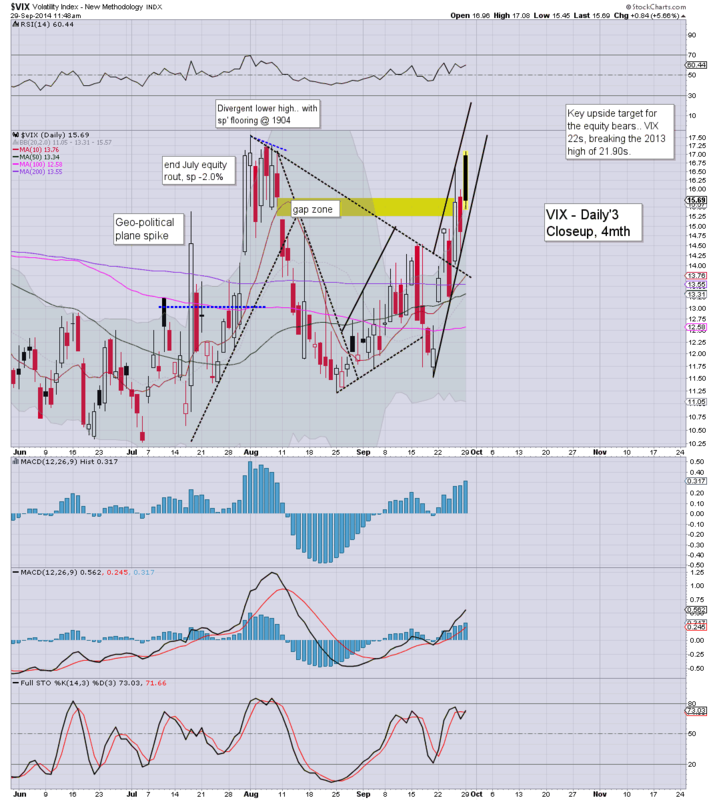 Yes the VIX is still net higher, but really, that sort of candle is usually bullish for the next day. Any 1990s tomorrow.. and it'll be back to the lunacy for new highs in October. *I remain annoyed at myself for not exiting at the open - when the VIX had a black-fail candle.. but then, I'm trying to trade a bigger equity down move.. So...for me...its pretty clear... bears need a daily close in the sp'1960s.. with VIX 17s. With two hours to go... it sure would get exciting if the bulls start hitting the exit button into the close. *I remain short from last Friday afternoon...seeking an exit in the 1950/40s. 2.11pm.. This VIX sure is twitchy.... almost +9%... and it won't take much of a nudge.. and this market is going to get upset into the close. Equity bears have everything in their favour... including the important weekly cycles. 2.29pm.. VIX is making a damn serious attempt to punch above the opening high of 17.08. With 90mins to go...this could be one hell of a close! Stay tuned! 1pm update - latter day weakness? 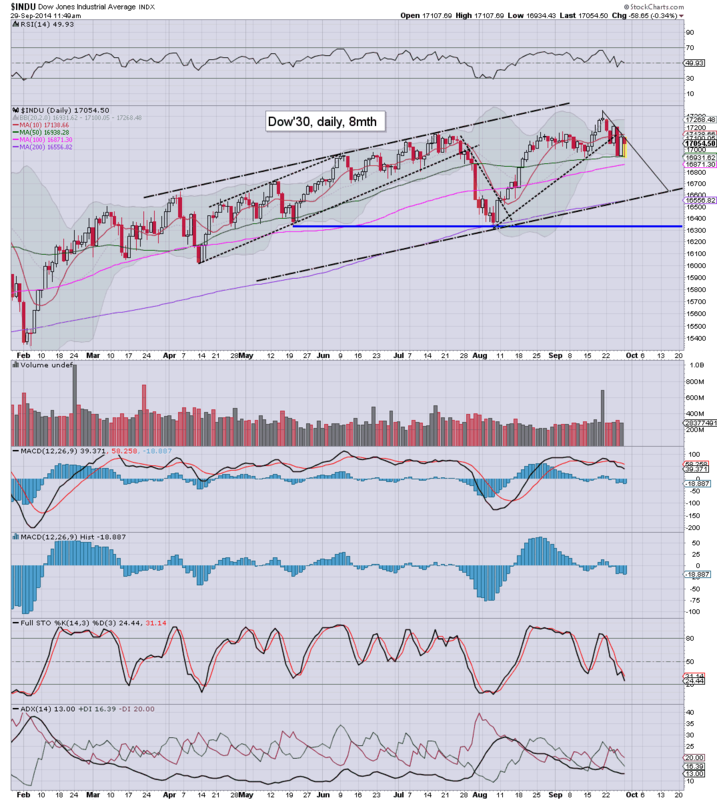 Having bounced (somewhat disturbingly) from sp'1964 to 1979.. the indexes are again seeing renewed weakness. For those equity bears seeking a key Alibaba top... the targets are clear, a daily close in the mid/low 1960s, with VIX in the 17s. 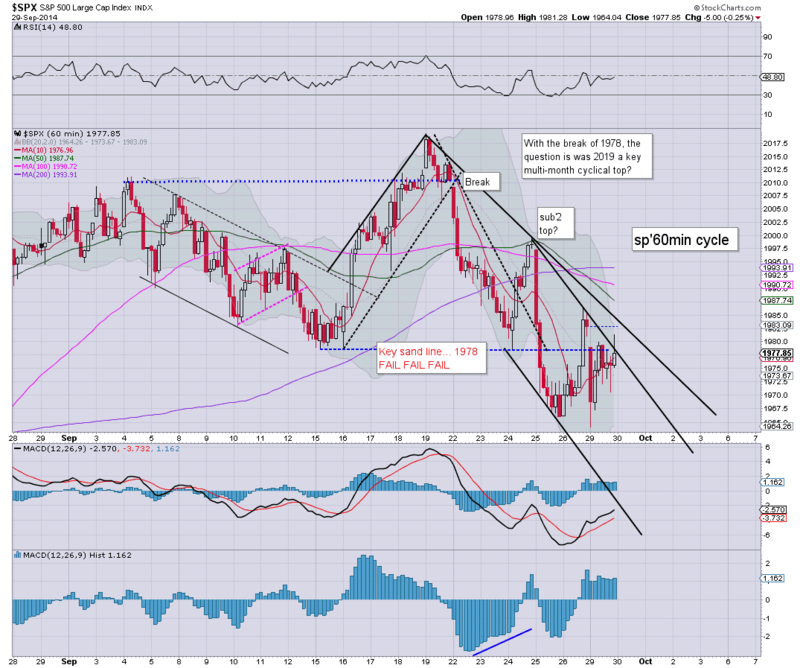 *after this mornings bounce I'm somewhat adverse to highlighting the smaller cycles. Weekly chart remains on SELL. Without question, for the serious 'big money' out there, short-stops would be around last Friday's high of 1985. Any move into the 1990s this week, and its white flag time. I hope it doesn't come to that. I'm tired of the low volatility..its frankly boring...and I think even the permabulls would dream to be buying 15/20% lower within a few months. 1.30pm.. VIX holding moderate gains of 7%.... nothing special.... the only good thing for bears is we did see 17s at the open. The remainder of the day...pretty critical. The bounce from the opening declines has been especially strong, and some bears are already waving the white flag, looking for new historic highs. Weekly cycles remain bearish, but if the indexes close positive today... then sp'1964 will mark just another higher low. *daily candle on the VIX is a real mess, how we close today is critical. Bears need >17.10.. but right now.. that looks damn difficult. For the bears... either we see a latter day sell off (and that is rarely the case in this market).... or this is going to mark just another higher low. I guess at least its not boring, right? 12.33pm.. chop chop.. sp -8pts.... but really... bears gotta see a daily close under the opening level..otherwise...daily reversal candles all over the place. US equities remain weak, and despite a notable bounce, equity bears can tout that the Thurs' low has been quickly broken, and confirmed via VIX 17s - the highest level since Aug'8. Rest of the day will certainly be.... interesting. *there was $2bn of QE fuel this morning.. a bounce was not unexpected. I'm kinda annoyed though that I didn't exit at the open.. I could have simply re-shorted already some 10pts higher. Oh well. For me, the issue now is whether we get stuck in the Dow 16700s..or keep on pushing lower to the Aug' lows. Where we floor in the current down cycle - from Dow 17300s, will likely shape the remainder of the year. *I'm resolutely holding short, will reassess near the close. Certainly, if we're in the 1950s, I'll probably close out.. even though the 1945/40 zone seems viable on Tuesday. The first snows of the autumn (at least that I know of) are making things even more contrasting... a true land of Fire and Ice. 11.41am This is getting borderline bad for the bears... at the current rate, we'll be positive by 1pm. If so..then its white flag time. The equity bears have already achieved some significant milestones, breaking the Thurs' low of sp'1965.. and confirmed via VIX 17s. The bigger weekly charts are offering 1910/1890 within the near term. Gold is catching a slight 'fear bid'. We're starting the week with a red candle....and primary target would be the lower weekly bollinger. As things are..I think equity bears should merely look for a slightly higher target of 1920/10s. 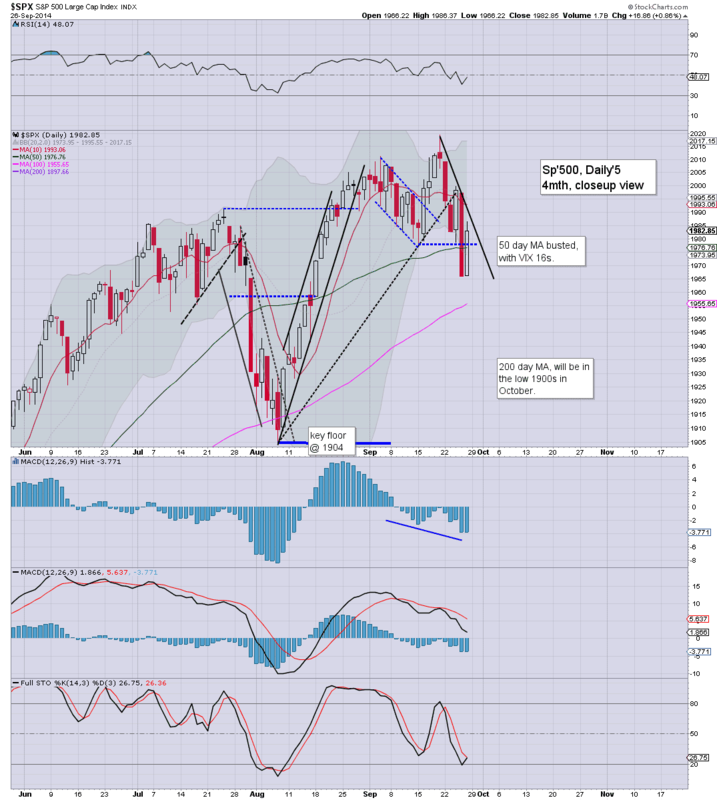 It is NOT necessary to hit the August low, although it is notable that the R2K has already broken it. *I hold short from last Friday afternoon, seeking an exit in the sp'1955/45 zone. 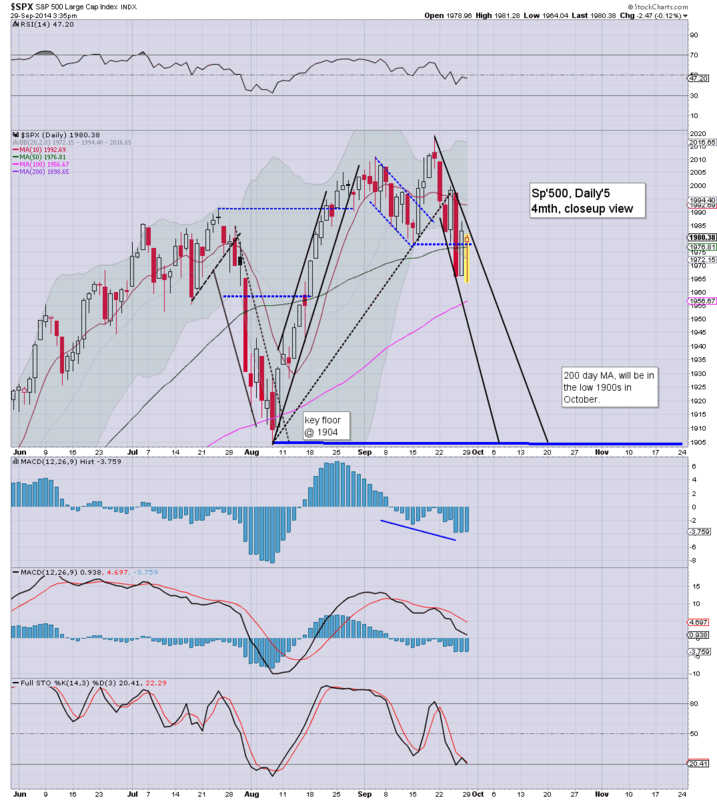 The 100 day MA of sp'1956/55 is next intraday target... we might a micro bounce from there. 10.09am.. minor chop... but still, the bears have already done some notable damage.. would be useful to see the 1950s by 11am... but not 'absolutely necessary'. VIX holding 10% gains in the 16s...it will VERY important to close above the opening high of 17.08... seems viable. Bears had better negate that by end day... with a daily close >17.10. 10.49am.. Bears getting really rattled by this QE fuelled morning bounce. Still...a long day ahead.... I ain't particularly concerned...yet. Good morning. Futures are moderately lower, sp -11pts , we're set to start the week at 1971. 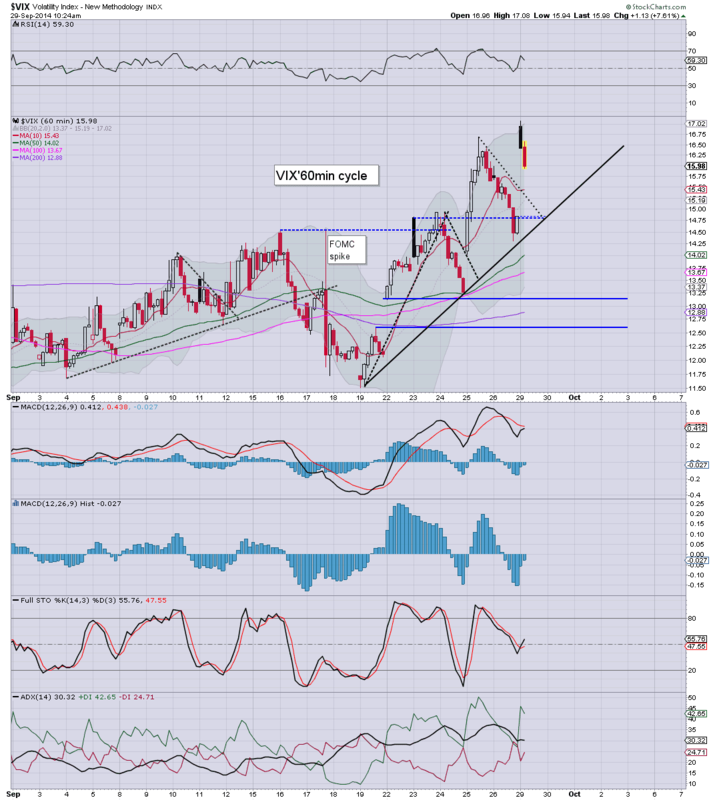 Metals are a touch higher, Gold +$3. Equity bears need to take out last Thursday's low of 1965, which will open the door wide to initial downside zone of 1950/40s by late Tuesday. So, we're set to open somewhat lower, just 0.3% from breaking the last weeks low. Certainly, given an hour or two, we could take out the low.. and just keep slipping into tomorrow. For me, the issue now is whether we get stuck around 1950/40s...or somehow can unravel to re-test the August low.. no later than end of next week. It won't be easy... the style of price action today and tomorrow will give us a good idea of where we might be trading across the next few weeks...perhaps even months. 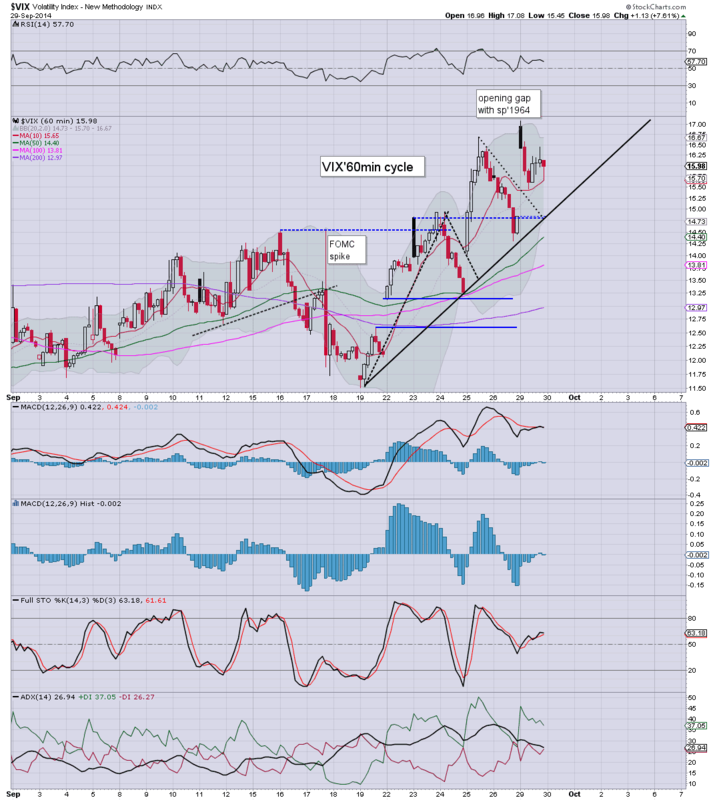 *as ever...eyes to the VIX, it can often offer more clarity than the indexes. Equity bears should be seeking VIX 17s by tomorrow. Sure looks like we're going down hard this morning. this is a good sign for the bears...will need some good confirmation via VIX 16s. 9.34am.. VIX 17s... a major achievement to start the week.